The Monstrous Regiment of Women: Juana Inés de la Cruz, "the Tenth Muse"
Juana Inés de la Cruz, "the Tenth Muse"
Her grandfather died when Juana Inés was still young, only eight years old, and the girl was sent to live with an aunt in Mexico City. There she hoped to disguise herself as a boy so she could attend the university, and though that didn't happen, she continued her studies privately. The extent of her learning ultimately gained her a public reputation, which led to her spending five years in the colonial viceroy's court, where she met (and was tested by) theologians, mathematicians, historians, and philosophers. Rejecting marriage, Juana Inés entered into a Carmelite convent in 1667 but, finding the discipline a bit too rigorous, she moved in 1669 into a convent associated with a different religious order, the Hieronymites. The Order of St. Jerome, founded in the fourteenth century, allowed her more latitude to devote herself to study. At the Hieronymite convent, she had her own study and library, she could pursue her interests in music, philosophy, and science, and she could continue her discussions with learned members of the church, scholars, and the court. 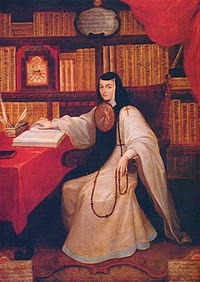 Sor Juana's intellectual pursuits and unconventional life (even in a convent) had always attracted criticism, controversy, and detractors. Her respuesta led ultimately to a condemnation in 1693 for "waywardness." Her response seems to have been to put down her pen and dedicate herself to penance. She died in 1695, nursing plague-stricken nuns in her convent. 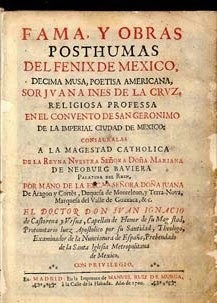 Sor Juana's literary output is significant. Margaret Sayers Peden's translation and selection for Penguin, Poems, Protest, and a Dream, offers an excellent introduction. This very affordable volume includes an essay about Sor Juana's life and a generous sample of her work, including romances, satires, epigrams, sonnets, selections from her plays, and Sor Juana's defense of women, her "reply" to the "most illustrious . . . Sor Filotea." This is also a dual-language edition, with Spanish on the left, English translations on the right. In the title for this post, I have put quotation marks around "the tenth Muse." Yes, during her lifetime, Juana Inés de la Cruz was praised with this phrase--a reference to the nine classical muses, daughters of Zeus and Mnemosyne, goddesses of knowledge and the arts. It's a compliment, I know, but every damn woman who wrote well, from Sappho on, was referred to as the "tenth Muse." (Plato was supposed to have said, "Some say the Muses are nine--how careless! Look, there's Sappho, too, the tenth!) I guess there can only be one great woman writer at a time--you know, in addition to those nine goddesses, maybe one woman could be a writer . . .